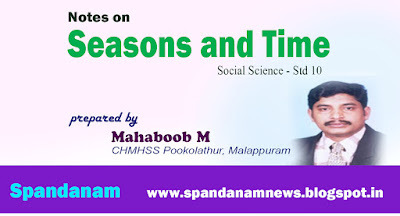 Notes based on the topic “Seasons and Time” of Kerala Syllabus Standard X Text book (English Medium) . These notes were prepared by Sri Mahaboob M, CHMHSS Pookolathur, Manjeri, Malappuram. It will be helpful to students and teachers. Team Spandanam is grateful to him for his great effort.